Born, lived in North Carolina. Little do we know about artist J. H. Rogers but that which we were told by Kimball Sterling. Rogers is a descendant of the Cherokee Native American Indian Nation. 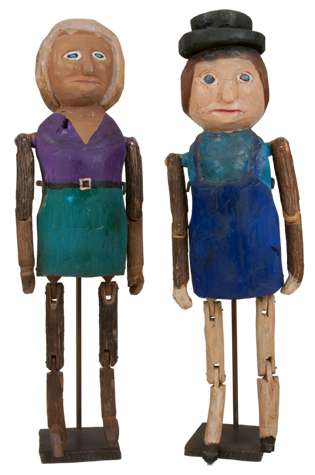 We purchased the 20" tall carved and painted articulated woman and man at an auction of a private collection at Kimball Sterling's in Johnson City, Tennessee. The carving technique is not fine as compared to Campton carvers. The wood is not scrap lumber but cut and whittled from the limbs and branches of a tree. Rogers has left the bark on a portion of the carved wood, a unique technique in lieu of painting. The expressions on the pair of figures are doll-like innocent.